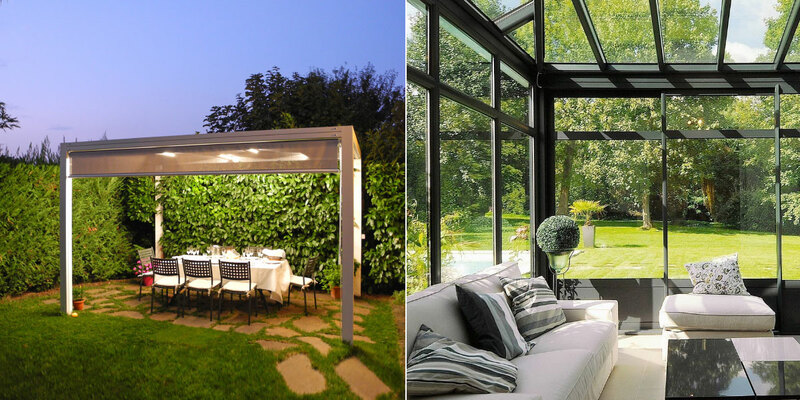 Blog / PERGOLA: WHICH TO CHOOSE? Are you looking for a shady pergola for your garden and don't know how to find your way among the various options present on the market? In this article, you will find some useful tips that will help you to choose the pergola that best suits your needs and your projects. First of all, you have to consider what purpose you want to use it for. Do you want to simply create a shaded area, or do you want to build a comfortable and protected environment, which can be furnished and lived in as if it were an additional room in your house? Once you have decided on the requirements, you will need to evaluate the products offered on the market based on the quality of the design and the materials used, in order to reach a good compromise between quality and price. As far as design is concerned, we recommend that you rely on established companies with many years of experience in the field, especially when the construction system includes automatic mechanisms and hi-tech components. The more complex is the structure, the more difficult it is to guarantee the perfect operation of the mechanical components. This refers to both the installation phase, which is obviously very expensive due to the lead time and the use of specialised personnel, and to structure preservation over time, as some systems require continuous check-ups and extraordinary maintenance. The decisive factor is the choice of the material, we now see the pros and cons of the various products present on the market. Visually very impressive, warm, and particularly suitable to recreate a traditional, family environment. The wood is always in vogue and, if looked after correctly, can have a good resistance to weather. However, the wooden planks must be treated regularly and accurately at least once every two years, to avoid damaging the structures irreparably. Iron is subject to corrosion, so continuous maintenance is required, especially in areas exposed to air with high salt content. This is usually a good choice if you want to cover the structure with climbing plants. In this case, in addition to anti-rust treatment, you should also protect the material against mould and moisture spots on the walls where they grow. Climatic conditions that occur in humid environments, such as gardens or areas with particularly dense vegetation, encourage the onset of these bacteria. We recommend that you treat the problem promptly to avoid nullifying all efforts made to create a small corner of paradise in your garden. This material is inherently anticorrosive, as the oxidative layer that develops in contact with the air creates a protective film, so it does not require maintenance, ensuring a better durability over time. Will this style suit your house or not? In order to create harmony between the existing building and the new structure, you can follow two paths: similarity or a pleasant contrast. 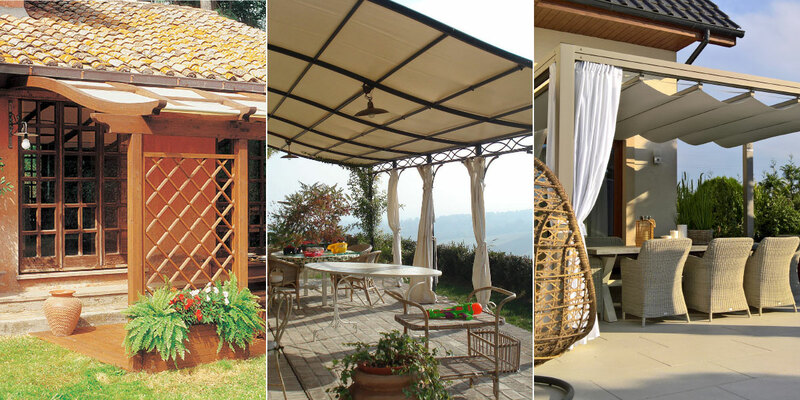 For example, if you have a country house in a rural style, a classic wooden pergola is definitely the right choice. A design developed with natural materials in mind will complement the surrounding environment perfectly. On the other hand, the inclusion of an aluminium pergola with a minimalist design, for example, would create an interesting contrast between its stark design and the plasticity and the chromatic richness of the stone and landscape, enhancing them to a great degree. In any case, for the realisation of your project, it is always best to rely on the experts in the field, such as designers and architects. Thanks to their specialised knowledge, they will be able to support you in choosing the most suitable or the most original solution, in line with the latest trends. A lean-to or a self-supporting pergola? Another aspect to keep in mind before making the final choice concerns the type of the structure: do you want a detached solution or a structure that leans against the house? In this case, the variables to be taken into account mainly concern the use: if you have a very large garden and want to allocate some parts of the space for certain purposes, for example, an area dedicated to children or an oasis of relaxation by the pool, the choice for you will certainly be a self-supporting structure. If the space available is smaller or if your objective is to extend your house and create a corner of relaxation to fully enjoy the view of your garden, then the ideal solution will be a lean-to structure. In this case, for those who want to use this space also for events, such as outdoor dinners and lunches, organising small receptions and parties will be more comfortable and functional than ever. But the advantages of buying a lean-to pergola do not end here. Another important requirement is that the structures itself must be an integral part of the building and cannot be dismantled by the user, while the roof and the blinds must be mobile, to measure the amount of light according to the weather.